This fascinating CD was received at a recital in Blackheath. It raises important questions about live concert listening v. recordings. The Warehouse (best know to concertgoers for the BMIC Cutting Edge series currently in progress, has had fairly recent acoustic improvements and this disc demonstrates that it is a fine recording studio. 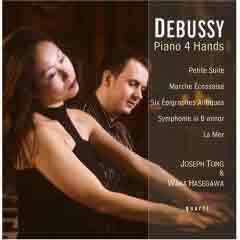 It is a fine sequence, starting with a lovely account of the ever-popular Petite Suite and finishing with Debussy's own arrangement of La Mer, which sounds far better and more convincing in its own right here than in Blackheath Halls yesterday; probably recorded on a Steinway? In between real rarities; the March (1891) based on a Scottish tune and probably intended for a brass/reed band; the épigraphes antiqueswhich are related to the lovely Chansons de Bilitis (1899-1914) and the first movement of the eighteen-year-old Debussy's unfinished symphony which he never got round to orchestrating. Recommended warmly to all Debussyists and collectors of four-hand piano music.